ZBot ( An experimental project. ) -> For any BattlEye rcon game supported! 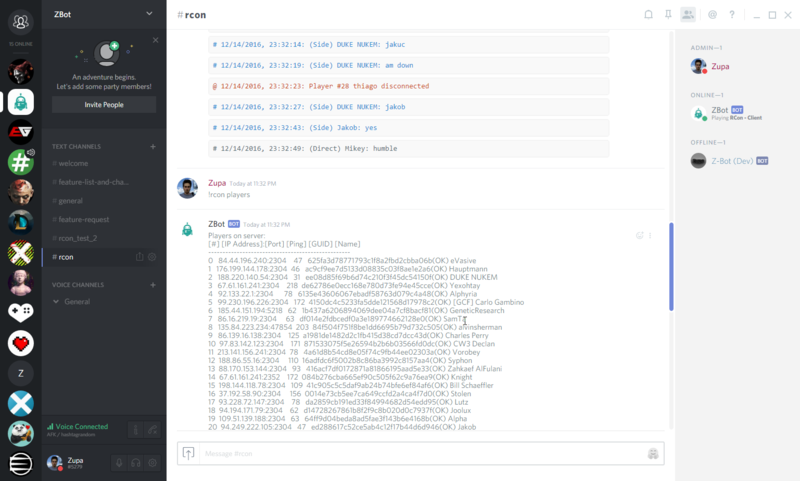 A Discord bot that can roam your Discord server and function as an RCON client for your BattlEye game servers. Execute RCON & Server commands to your arma server in the assigned Command channel. Protect these commands with an appropriate Discord Role. 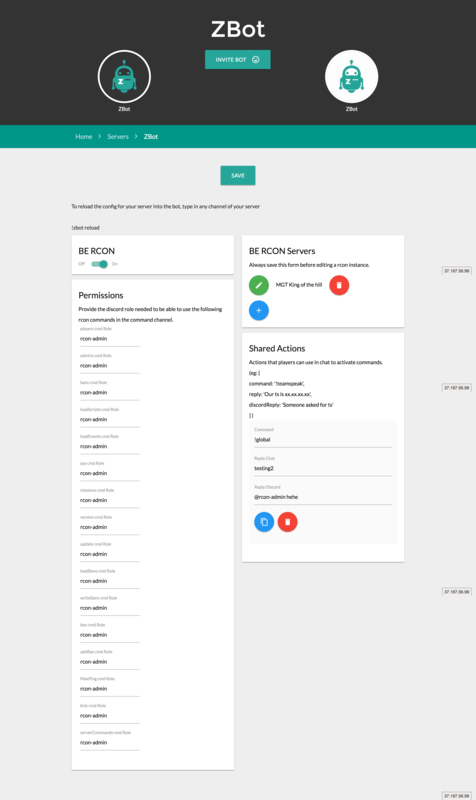 Webpanel to configure your rcon-game servers. 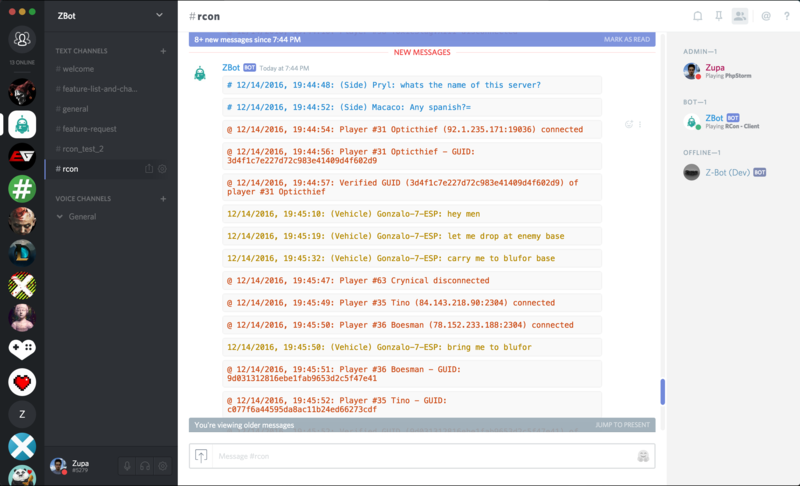 List players, admins & bans trough rcon commands. ( All BattleEye commands supported ). 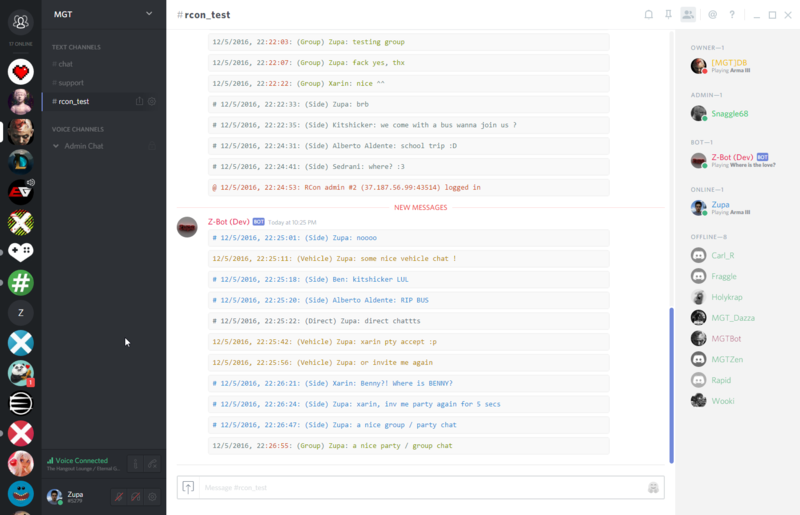 UPCOMING in next version: Schedule text commands for ingame/discord through the web panel. How to add it to my server? Follow the flow of the site. It should be straightforward. Always remember to save a page if needed before navigating to another page! Add the bot before or after you filled in all the info. ( The button on top ). Whenever you make changes in the config panel you need to reload the config of your server onto the bot. This commands also refreshes your rcon instance if it would have stopped for some reason. All commands are prefixed with that aswell. !rcon say all Welcome you our server! MaxPing [ping]            Sets the maxping of the serve. Please provide as much feedback as possible ! 1 mistake by myself can crash the whole bot. So if there are still use cases where it fails we can finetune it! You can join our discord server to discuss or report bugs ( or the topics ). Technical info about the bot. Hosted in france on a good server. Coded in NodeJS ( Ecmascript 6 ). The bot will be hosted by myself until we encounter any problems we can't solve that way. If i ever stop hosting the bot i will release the sourcecode. I might also release the sourcecode earlier. ( If i know you, you can ask me for access to the code).